New "Ski Route Photos" section? Well no, I didn't really ski any of this terrain that day while hitting Muir and the Paradise Glacier. But I was trying to scout out the Fuhrer Finger, since a few of us have recently been thinking about trying a ski descent. �The climbing conditions page on the park website still claims the route is "in shape" as of June 15. Unfortunately, the photo below shows that this route is probably becoming too melted out to be a safe or worthwhile ski descent anymore this season. �It's now down to just a narrow skiable passage through the rock bands near 10500 ft, and I probably wouldn't want to climb it now either due to increasing rockfall hazard. It is definitely still skiable, but barely so. However, the Turtle Snowfield looks to be in super shape, and skiable all the way from Camp Hazard through the rocks above the Turtle (this uppermost portion does have a high icefall hazard from the Kautz Ice Cliff, though). I hope it is OK to have posted a non-ski report here, since I think it shows useful route info (I would have liked to have seen a similar recent photo anytime during the last 2 weeks). The Mount Hood NF site now posts current photos of the Hood south side route, but I doubt the NPS will start doing anything similar for Rainier. 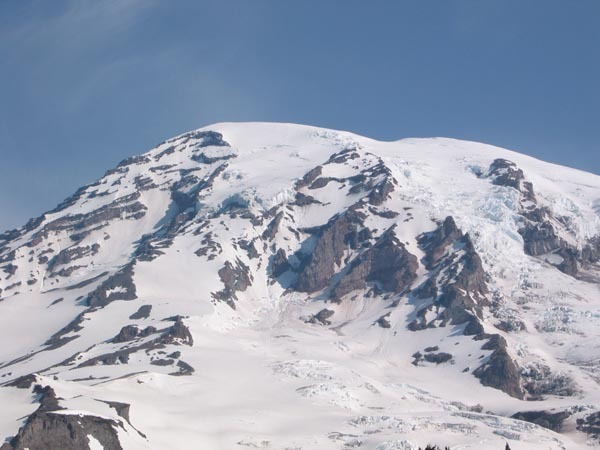 Perhaps we should have a section here for current ski route photos of Rainier, Baker, Adams, etc., which could be kept well updated by the increasingly large and wide-ranging membership. Click here for a double-size version of this photo. Sounds like a great idea to me. A picture, or five, (even with a dial-up connection) is worth thousands of #@#$! words!!!!!! I also think this is a good idea. It is easy for me to set up a new board. It should go in "Hot Air", and needs a title - any ideas? How should it be organized? I could set up a bunch of threads for different areas (how many, which? ), then people could add photos (with any necessary descriptions, but no TRs?). Should posters be able to start new threads, or only add to existing threads? The "one photo/post" rule would obviously be suspended for this board, but how about width - anything goes? Photo files would still need to have a preexisting home somewhere on the web. Please post your additional ideas here, and I will set up the board in a few days. One way would be to have sections for all the volcanos, and maybe some generic area sections for other peaks, although that way there might need to be sub-sections for the different aspects. Another way to do it might be to organize it by trailheads, so that all the routes and/or peaks accesible from one spot would all be lumped together. I think that might be my preference. Title: Something simple like "Ski Route Photos"
Organization: We could start off with some pre-built threads for the major local volcanoes and mountains. I think people should be free to start new threads for other peaks, but should be encouraged to keep only one thread per mountain once it has been started. For the more popular peaks, perhaps one thread per mountain per year would work best, with the threads named for example, "Mt Rainier Route Photos, 2003", so that next year we could start fresh and avoid having too many photos in any single thread. Photo Width: Keep the current 600 pixel limit (to avoid having the text run too wide), but also encourage people to link to a higher-resolution photo (1200 or more pixels wide). I'd be happy to get this section off to a flying start by posting some of my numerous recent route photos from around the Cascade volcanoes. Yes, I think most of us have very useful photos, but not all of us are able to post from another web address. Is it too complicated to set up a way for someone to post a photo right from a computer, say, in "my briefcase"? I have seen this available in many other sites (biglines.com) (cascadeclimbers.com) but this is the site i find most useful, and like to post here. Check out biglines "photo" section, and let me know. You can post from anywhere on your computer, just "browse". Ok, easy issue first: posting of photos. The way it works right now for inserting a photo into a TR, the photo file must reside on a computer which is always connected to the web and which is set up to share files on the internet (a "server"). While some people have a home computer set up as a server, most don't, and this means that you need to upload the photo file from your home computer to a server. This is generally not a big issue though, because there are lots of free photo hosting sites, and most people have "web space" on a server with their ISP account where they can place the photo files. Then, it is just a matter of inserting a photo link into the TR, pointing to the actual file (the "YABBC tag" button third from the right inserts the code). I theoretically could set things up so that my server (where TAY is hosted) would accept photo uploads, but I don't really want to do that for several of reasons. One, I don't have a lot of extra space, I'm constantly filling it up more, and I'm not sure I want to get into opening up my server like that. Two, I don't really want to take the time at this point to set this up - I've got too many other things going on, including kids and skiing. The tougher issue: a Ski Route Photos section. In the posts so far, I see two different levels of organization suggested. Amar seems to be suggesting that the new Ski Route Photos be a "board" (simply containing a bunch of threads, with no sub-sections possible), whereas alpentalcorey seems to be suggesting that the new Ski Route Photos be a "category", so that it could contain a bunch of "boards", each specific to a particular volcano or region of the mountains. The latter is the way that the Route Reports section on cascadeclimbers.com is set up (http://www.cascadeclimbers.com/threadz/ubbthreads.php?Cat=&C=1). Neither way would be a big deal to set up, but we should get it right from the outset because rearranging it later would be a bigger deal. The board approach (Amar) would have the benefit of being simple to browse, with all Ski Route Photos threads accessible from a single page, but could become hard to use if there ended up being a lot of threads from many different areas (threads sort by most recent post, and there would be no easy way to keep, for example, all Mt. Rainier-related threads together). The category approach (alpentalcorey) would make browsing threads more difficult (because they would be spread across a number of different boards), but would make it easier to focus on the particular volcano/region of interest, especially if there gets to be a lot of threads. -----thread 3, (ie. photos from the east) etc. This is just for illustration purposes - the specific boards would need to be decided on. Please post additional ideas/preferences. Re: New "Ski Route Photos" section? I'm all in favor of the idea of multiple boards. I didn't realize that it was an option, or that you (Charles) were leaning in that direction. But I don't know if we should sub-divide into too many separate boards, like separate boards for Rainier, Adams, etc., since there would logically only be a few possible threads in each single-mountain board. Looking at the trip reports posted here, the majority are obviously from WA, with most of the remaining reports from OR, CA, and BC. So perhaps we could have 3 or 4 boards for WA (Northern, Central, Southern, perhaps also Olympics), with one board each for OR, CA, BC, and Other Regions. Is it a lot of work to sub-divide the boards further in the future if needed? I'm not really sure how many route photos will actually be posted, and for how many different mountains. I think this should be adequate for at least the next year or more. Charles - Not all of us are very familar with the coding necessary to insert a photo. Could you add examples to your photo guidelines to help the near illiterate . I find even one photo greatly increases the value of a TR. If you do create sections for route photo's it would be nice to build an archive by having people submit from past reports. With the date included it could give a perspective of how route change month to month, or with heavy/light annual snow fall. Russ, I have added how-to info to the photo guidelines thread. Please let me know if it is not clear or you still can't get a photo to show up in your post. It sounds like we are pretty much in agreement about the new route photos section. I will go ahead and construct it along the lines of Amar's latest suggestions. Moving a lot of threads from one board to another (or a new one) involves quite a bit of time and clicking as things work right now (one thread at a time), but I seem to remember that there is a YaBB modification available that would enable me to do it in groups of threads, which would make splitting boards very easy. I will look into that modification. I am open to other ways of dividing up the Cascades, so please post your opinion. After this matter is finalized I will open up the new boards and let the posting begin! How 'bout we make the division between South and Central everything north of Naches Pass? That way most of the questionable hikes and tours north of Crystal get included without question. Gaper_Jeffey, your powers of observation need work. There are already separate sections for OR and CA. Charles, in order to eliminate this confusion, maybe these 3 sections should be renamed "North WA Cascades", "Central WA Cascades", and "South WA Cascades". But what about eastern WA? There are mountains over there (e.g. Okanogans, Selkirks, and Blue Mtns), although I don't think anyone has yet posted any trip reports from those areas to T-A-Y. Perhaps you could just add a "Rest of Washington" section which would include the Olympics and eastern WA, everything but the WA Cascades. I added an Olympics+rest-of-WA board, and fixed the 3 Cascades board names. Charles - looks like the Ski Route Photo section is well underway - can't wait to post some beta shots! Good work. I just finished tidying up the new section, and I set the boards to allow posting. I'm looking forward to seeing how this section develops, and think it could turn into a great resource for all of us. Unless anyone objects, I guess I will move this thread to Random Tracks in a few days. I'm sure there will still be room for improvement for this new section, so feel free to continue to offer suggestions. I can already see that trying to keep photos below the 600 pixel width is not going to work out too well, so instead of fight it, I think it would be easiest (for me) to dump the limit. After all, the section is all about photos, and so text concerns should be secondary. Maybe there should be a suggestion that photos be no wider that 800 pixels, with an external link to wider versions of the photo. I think we should definitely keep some limit on the width of photos, either 600 or 800 pixels for this section. I really dislike the huge wide photos that I see in the middle of threads on other sites. We should strongly encourage links to a much wider version of the photo, since this is often very helpful for seeing route details. I have added links to double or triple size versions of most of my route photos in previous trip reports, it takes almost no additional work to do this. Perhaps the "guidelines and how-to" info could be updated to include instructions for a suggested way to link to a wider version (especially how to use the useful "url=" tag, not just the plain "url" tag). Hi Charles, do you think the width limit could be 640 rather then 600? 640 is more of a standard size. And, as I understand the guidelines, if a thread for the route/view of the mountain already exists I need to post in that thread? E.g., I want to post a photo of the Southside of Adams I should add that to the thread Amar created? Once a lot of photos accumulate for a certain view it may be awkward to always scroll to the last post? OK, lets go with a suggested 640 pixels width limit (on my 15" monitor this will run off the right side a little bit, on my 17" it will be no problem). I don't think that I want to spend the time enforcing this, though, so it is up to posters to follow the guideline (I will continue to be more strict about 600width/one photo in TRs, though, as the most important thing there is readability of the text). Gaper_Jeffey, adding to an existing thread is the way to do it for ski route photos boards. It may turn out that in a particular thread there will get to be too many photos for easy viewing. In that case, I could go through the thread and delete some photos (don't show routes as well, too close in date to other photos, etc). I think it will take a while for this to become a problem. When I have a chance, I will revise the ski route photos guidelines threads. I will add the bit about including a link to a larger version of the photo, and also how to use the "url=" tag (maybe I can find a way to change the "YABBC tags" button so that it does this).